Just to try something new, I have tried to adjust current PI controller to be PDF contoller(http://stablesimulations.com/technotes/pdf.html). Apart a cool name , it also has nice property: it is never overshoot. Note: Do not drop Level I to 0, as you would not have stick control at all. bonjour comment fait on pour intergrer le code dans le 1.7 doit on suprimer des lignes avant et les remplacée par celle ci ou les rajoutees en plus et ou. un copier coller ok mais ou ?? This does look quite interesting! How can I integrate it into one of the later dev versions? I'm using 0714 r207. spagoziak wrote: This does look quite interesting! How can I integrate it into one of the later dev versions? I'm using 0714 r207. So I've had a chance to test the PDF controller and I'm both impressed and disappointed! I hope it's just me not understanding how this thing works. It's very windy for testing today, maybe 9mph with 15 mph gusts. It's a great environment to push the PID values and expose any issues. I was able to add another .5 to P on pitch and roll, and another 1.0 on yaw! It's becoming clear that there are several things different from 1.7... I would never be able to fly on 1.7 on these values. However, auto level has some interesting features with the PDF turned on. It's impossible to get the wobble of death, even in strong wind & ground effects. It just will NOT screw up. That is brilliant!! However, like dm said, if I is too low, the quad flies like the RC rate is at .10. The trouble is... auto level doesn't .. level! If tipped to maybe 75 degrees and then flipped on, the quad will fix about 30 degrees and then hold steady. Moving it from that position by hand is a real chore, so it seems to be thinking level is -45 degrees. If I tip it only 20 degrees and turn AL on, only a few degrees of level are restored, then position holds again. I even turned P up to 25 (max) and flew it in this strong wind.. no wobbles, but still no snapping to level. Am I misunderstanding how to tune this? Or is it just not quite right in the code yet? Here are my current settings, just flew them 5 minutes ago and got the results I described above. So it turns out that I had my BMA180 set to 0x80 when it should have been 0x82, under the sensors tab. I've had to make that change for 3 full versions now, you'd think I'd have remembered! Anyway, once that was sorted out, I began tuning indoors tonight, in a largish space where there's enough air to discount ground effects after 5 feet. After a two batteries of up and down, I must say I'm really impressed with how soft and gentle the leveling process is. Just like _dm said, the control is mushy. It seems this improves by increasing I dramatically. I need to fly this setup FPV before I'll know where I needs to stay. I managed to turn P up too high and all it caused was a bit of a nervous twitch, never a wobble of death. I backed it off .6 and in dead air leveling was smooth. Thank you spag for this feedback. The multi would still be controlled via a rate mode (like in acro), but there would be also a component which would force the multi to retrieve an horizontal level position (with a customisable relative weight) => this LEVEL mode would be just an assisted acro mode. I think it would be more natural. this LEVEL mode would be just an assisted acro mode. I think it would be more natural. Kind of fly Acro and center sticks then it will Level..
Alexinparis wrote: Thank you spag for this feedback. Ok I had a chance to fly it in light wind today. Turns out I had P turned up too high for wind; the craft was a bit twitchy. Turning that down helped it remain smooth. The main drawback of the filter still remains though: too passive about leveling off. This form of auto level would do poorly as a panic button. For video flight, perhaps. I think that a properly isolated and tuned ACC will offer smooth stabilization and wicked fast return to level when needed. However, it would be neat to have an option in the GUI for an autolevel expo, similar to pitch/roll and yaw rate. I'm thinking the expo would effectively give more rate as the stick moved farther from center, avoiding the typical mushy response when AL is enabled while preserving the power of AL when it was needed. Alex, I think this is what you meant, right? This PDF filter is working very well for at 20hz. special thank to you ziss_dm. Is it doable and efficient to have this filter between 10 and 20? is it possible to change the 6 values to 10,12,14,16,18,20 ? is tihis supposed to still work with latest v1.9+ ? when in acro mode, stick input works as expected (max servo output 1900 for pitch). When in level mode, I have almost no control over servos with stick input for pitch and roll (on flying wing) (max servo output ~1560). I just tried this with the latest shared code. 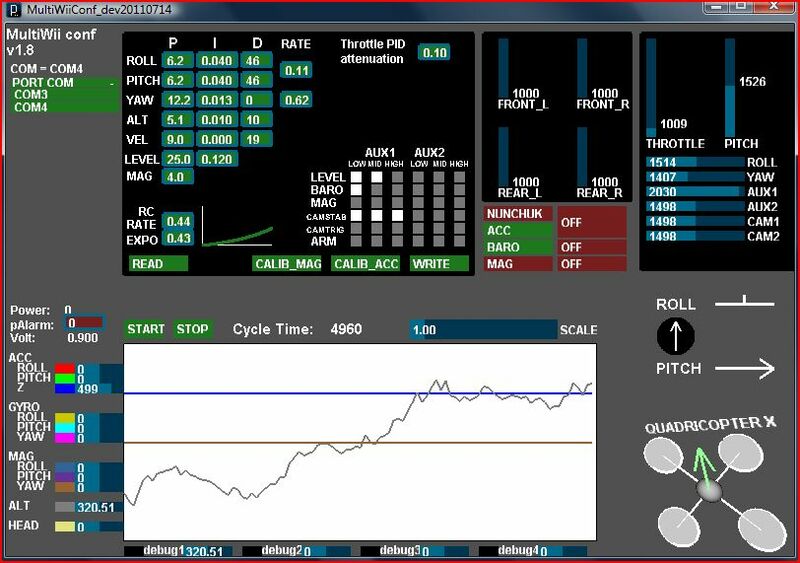 with the default PID values, there is completely no pitch and roll control !!!! not cool. probably should be fixed or just completely removed, obviously nobody is using this feature. I don't think anyone uses it any more. Level mode has mode on + we now have horizon of course. I wanted to develop further and repost at some time, but just too much on at the moment. I still fly some my copters with a variant of this and see it as a definite positive improvement.